The holidays are on the way! It is time to start thinking about Christmas parties. Whether you are throwing a personal party for your family and friends or need to find the perfect venue for your company’s holiday get together, Four Bar K can help with all your needs. Our spacious event space is over 13,000 square feet and will be beautifully decorated for the holidays. We are talking the whole nine yards here: lights adorning all visible surfaces, wreaths, trees and whatever else you might need or desire. We perfectly merge the shabby ‘chic’ feel of West Texas with that of Christmas to help you throw the best possible party that celebrates the unique culture of the holidays in Texas. If you want to get your guests up and dancing during your Christmas party, then we can help with that as well. Our live band can play everything from seasonal favorites to religious songs to help you, and your guests get into the holiday spirit. Want a bit more control over the music? Do not worry, as you can book and work with our DJ to set a perfect list of music to keep your Christmas party moving. We also offer a full Karaoke set-up if you would like a fun option for your guests to entertain themselves for the evening: fair warning though we do not offer vocals lessons and are not liable for any hearing damage caused by those less vocally inclined! For Christmas parties we have open bar options, allow BYOB and can also work with third party vendors to make sure Christmas cocktails are in stock. Our Christmas and holiday schedule books up fast as availability is quite limited in December. So it is important to get started planning today. 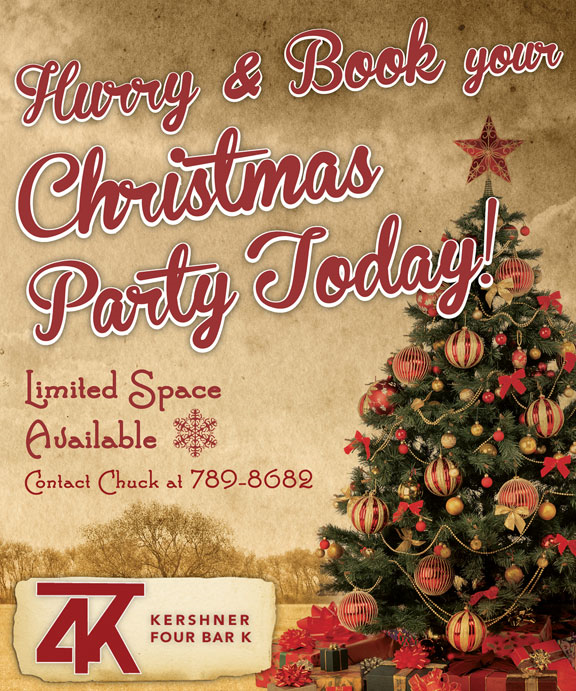 Call Four Bar K to set a date and begin the process of throwing a Christmas party that you and your guests will not soon forget.